David Dollar of Brookings argues that the fall in China’s current account surplus is a great under-reported success of U.S. economic diplomacy. I more or less agree; my big worry right now is that China could end up reversing some of the policies that led to the fall of its surplus. The risks associated with its domestic stimulus have become more apparent with time, creating pressure to pivot back to a more export-driven growth model. 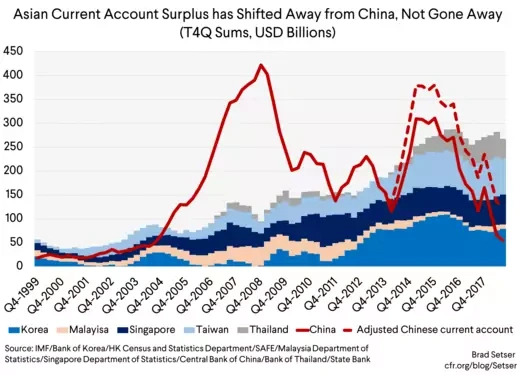 China shouldn’t get credit for the portion of the fall in its surplus that solely comes from changing the way it measures its tourism imports, particularly as the change clearly overstates imports and thus artificially lowers China’s overall surplus. A portion of the adjustment was inevitable if China wanted to grow rapidly: China could not have grown as fast as it had without some shifts. 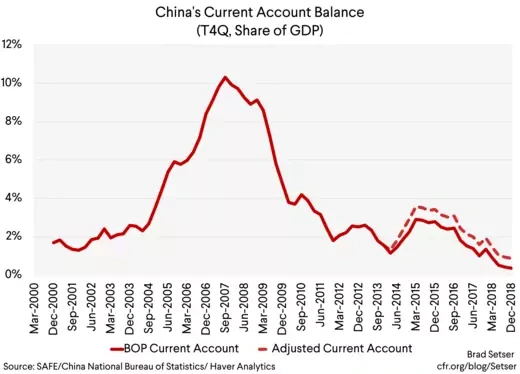 Going from a $3.5 trillion economy to a $12 trillion economy with a 10 percent of GDP surplus would have meant that China’s surplus would need to grow to an untenable $1.2 trillion. China though should get credit for the fact that its surplus didn’t grow in line with the growth in its trading partners. Adjusting for their growth, $350 billion would have gone up to somewhere between $450-500 billion now—and the actual surplus now (even after adjusting for tourism over counting) is in the $100 to $150 billion range. There was a real adjustment. China’s adjustment doesn’t rest on a firm foundation. The huge surplus pre-crisis came even when investment was relatively high; it implied absolutely crazy savings rates. The safe way to reduce the surplus would have been to bring national savings down aggressively through policies that increased the availability of social insurance (more public health spending, higher basic retirement benefits, fewer social contributions that act as forced savings vehicles; see my paper on Asia's savings glut and this IMF paper). Instead China took an already high level of investment even higher—and put itself in a position where sustaining the external adjustment requires domestic policies that many (including the IMF) consider unsustainable. Unlike the Economist (which thinks China is headed toward “structural” external deficits), I think China’s external adjustment is fragile—and, absent broader adjustments, only will last so long as China is willing to juice investment with loose credit and run large hidden fiscal deficits to fund high levels of infrastructure investment by local governments. The adjustment is more cyclical—or perhaps policy driven—than structural; without the big augmented fiscal deficit the surplus would jump back up. And I would add a big caveat to David Dollar’s argument that China represents a success of American economic diplomacy and its broader engagement with China, namely that the United States didn’t repeat that success with its allies elsewhere in the region. 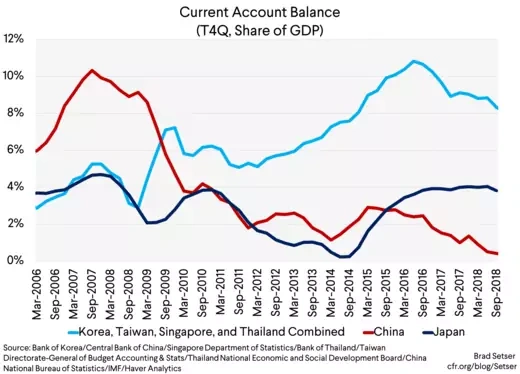 Much of the fall in China’s surplus was offset by a rise in the surplus of the Asian newly industrialized economies (NIEs) of Korea and Taiwan and Singapore, along with Thailand’s rising surplus. Their combined surplus is two times bigger, as a share of their GDP, than it was before the global crisis. When you combine their rising surplus with the fact that China’s own adjustment came through a rise in its commodity imports (and to a lesser extent a rise in outward tourism), there wasn’t much of an adjustment in the pattern of manufacturing trade across the Pacific. So it seems to me that the balance sheet for U.S. international economic diplomacy over the last ten years should include both a credit for pushing China to adopt a set of policies that brought about an adjustment (even if the sustainability of those policies is now in doubt) and a debit for failing to pursue a diplomatic agenda to keep the surplus of other Asian countries from rising as China’s surplus fell.